Putting the Push Back into Pushbike, originally uploaded by [Zakkaliciousness]. With perfect timing that comes from years of experience she launches into motion. Note the traffic light. It is red and, beneath it, yellow, which means that it will turn green within 2 seconds. I've always wondered how the word 'push-bike' [or 'pushie' in Aussie slang] was developed. Seems a strange way to describe the mechanics of a bike. Sure, you push down on the pedals, but it really is a bit of a linguistic longshot. In English we say that we'll 'walk our bike'. In Danish it is called 'pulling it'. What is it called in other languages? Do you push it, walk it, pull it - when you're not riding it? Let me know. ps. 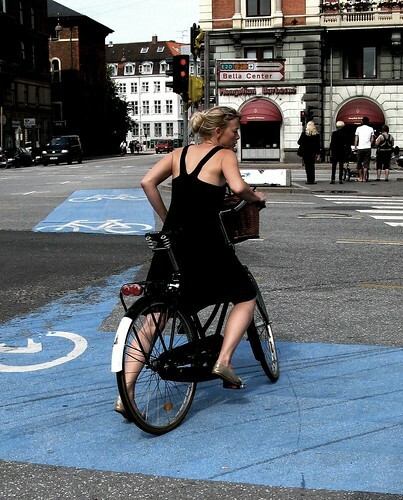 To comment on a comment; you do see heels cycling the streets of Stockholm. I should know. "Push bike" properly refers to a non-pedalled bicycle. =to make it go forward you sat on it and pushed with your feet.